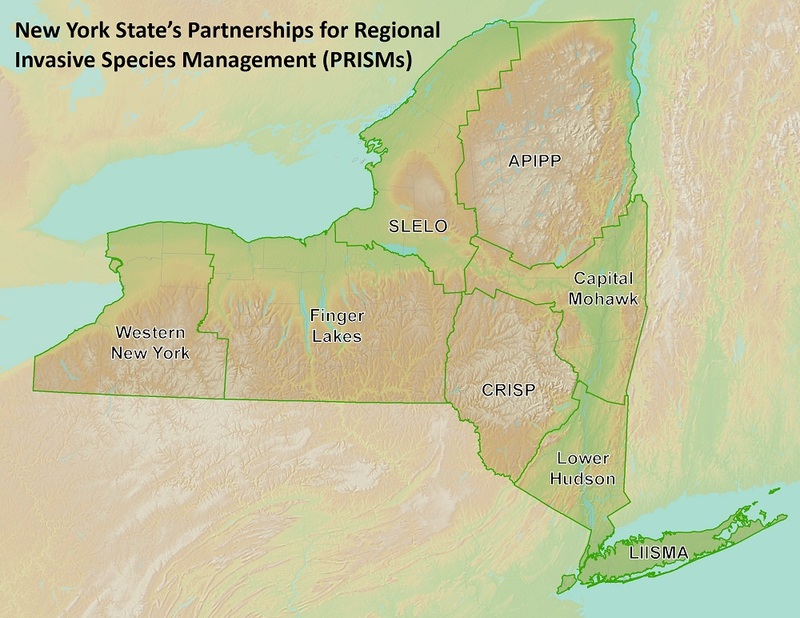 WNY PRISM (Partnership for Regional Invasive Species Management) is one of 8 regional partnerships in New York State created to help prevent or minimize the harm caused by invasive species to New York’s environment, economy and human health. We provide leadership, coordination and information for the western New York region, and are involved in all aspects of invasive species prevention and management. We combine and leverage resources to implement the full suite of actions required to stop the spread of invasive species. The WNY PRISM region covers the eight westernmost counties of New York State including Allegany, Cattaraugus, Chautauqua, Erie, Genesee, Niagara, Orleans and Wyoming. The eight-county region is home to over 1.5 million people and nearly 6,500 square miles, not including the adjacent areas of both Lakes Erie and Ontario. WNY PRISM was established January, 2014. WNY PRISM is funded by the Environmental Protection Fund (EPF) through a contract with the Department of Environmental Conservation. We are a sponsored program of The Research Foundation for SUNY at Buffalo State, and are hosted by The Great Lakes Center. Responding to the growing problem of invasive species, New York State passed legislation in 2003 that created the New York Invasive Species Taskforce (ISTF). The 2005 ISTF Report led to a 2008 statute, known as Title 17 of ECL Article 9, which established the New York Invasive Species Council (ISC) and Invasive Species Advisory Committee (ISAC). Among the Council’s numerous statutory responsibilities is the requirement to support, within available funds, and encourage Partnerships for Regional Invasive Species Management. For more information on the statewide response to invasive species, visit the New York State Invasive Species Clearinghouse.